This post is about an October 2008 visit to Calgary. I needed a restaurant on or near Stephen Avenue for a dinner with friends. A few years ago I went to Divino Wine & Cheese Bistro for dinner and throughly enjoyed myself, so I decided it was time for a return visit. The decor of the restaurant is contemporary with lots of brick; a perfect place for the young professionals in the area to unwind after a hard day at work. Not to say that you have to dress up to eat here – there were quite a few people in sports jerseys and jeans, grabbing a meal before a football game. Some of us ended up ordering some of the same dishes, so there are actually only three photos. I also have to apologize for the blurriness of the photos; it was pretty dark in there and after taking numerous photos I gave in to my hunger instead of my need for perfect photos. One dish ordered was the Mussels & Frites with vine ripened tomato, garlic, white wine, parsley & caper broth. The mussels were large, fresh and perfectly cooked. 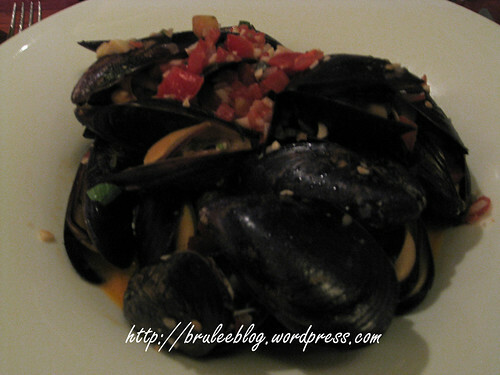 The accompanying broth had a strong tomato base that complimented the mussels very well. 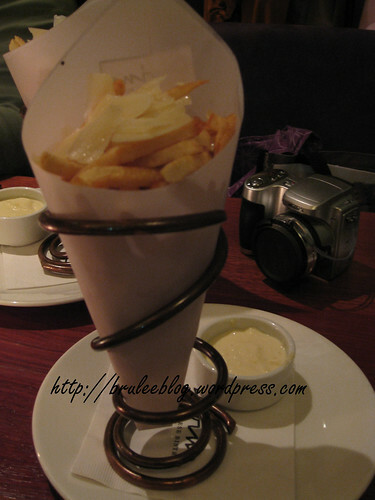 The fries were served with an addicting lemon aioli and Parmesan shavings on top. 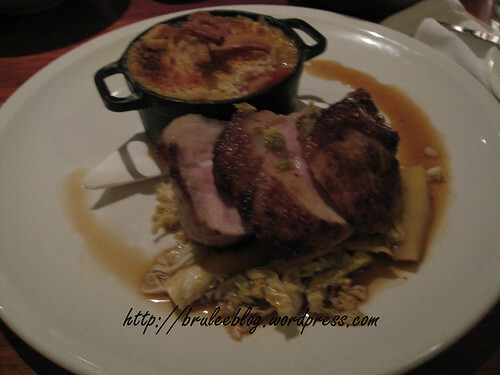 Another dish ordered was the Berkshire Pork Roast with white bean cassoulet, savoy cabbage, roasted pink lady apples. The pork roast was tender, but the really tasty part of this dish was the cassoulet. We were all too full for dessert unfortunately. As we left we passed one of the chefs working on some desserts and they looked amazing. The mussels and frites sounds like a great summer lunch. We had a great time at Divino’s. The food was excellent. The waiter who served us was a bit of a snob. We asked him to suggest a pinot grigio. Luckily we tasted the one he suggested before ordering a bottle. The taste was so acidic. We ordered another pinot from Veneto, which was excellent. We kept on asking him for bread, because it’s nice to have some bread when you are having a glass of wine. The bread was not coming. Had to ask hime 3 times. Finally when our mussels and frites arrived he served the bread!!!!! Have no idea why. Anyway the rest of our dinner was perfect. Their washrooms could use some attention. On my washroom door was no lock. Definitely needs a reno!! !